Clivia species – by Di Mathews | Melbourne Clivia Group Inc. The clivia genus is small, contains only six known species, and it belongs to the Amaryllidaceae family. 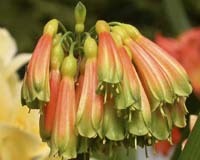 The clivia is endemic to Southern Africa, and is world renowned for its showy flowers. Each species has flowers which are borne on the end of a peduncle, or flower stalk, and this inflorescence is called an umbel. 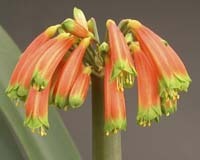 Clivias are slow-growing plants, and are long-lived. The six species are evergreen, with thick fleshy roots that are very well-equipped for water storage during periods of drought. The plants were very popular and sought after in the late nineteenth century, after which they faded from view for a significant time. They have now been “rediscovered” in recent times, and are perfectly suited to modern life. They make ideal container grown plants for both indoors and the shady exterior, and they will grow outdoors, under trees and in narrow dark spaces where few other plants will flourish. They have spectacular flowers in a variety of colours, and are now the subject of near obsession around the world, where electronic communication has enabled enthusiasts from different countries and regions to communicate with each other, and also to trade seeds and plants which are considered highly desirable (Koopowitz pp18-20). The six species of clivia will be discussed briefly below. The name ‘caulescens’ refers to the very distinct aerial stem that is developed by the mature plant. Clivia caulescens is found in the evergreen forests of sheltered ravines and damp valleys of mountainous regions. It is found growing either on rocks which are covered with moss and lichen, or on tree trunks. The roots make their way through well-decayed leaf mould and humus covering the rocks. They are found in the mountain forests of the Eastern Transvaal and Swaziland. These clivia usually grow from 500mm to 1500mm in height, however, mature plants form long, leaf-bearing aerial stems, which can be one metre in length, and in rare cases as long as three metres. The leaves of this genus are smooth and pointed, usually between 35 and 70 mm wide, and the length between 300mm and 600mm. This plant thrives in cultivation, doing equally well whether used an an indoor plant, or planted in a shady part of the garden, and will flower reliably each year as long as their growing requirements, for example, good drainage, are met. The name ‘gardenii’ is in reference to Major Robert Garden of the 45th Sherwood Foresters Regiment, who sent plants of this species to the Royal Botanic Gardens, Kew. Clivia gardenii are usually found in steeply sloping areas, usually south or south east facing, in evergreen forests under a very tall canopy. They prefer a welldrained soil in the wild, but have been recorded in marshy areas as well. They come primarily from KwaZulu- Natal, and have also been found in Swaziland. The name ‘miniata’ is in reference to the flame-coloured flower, “coloured with red lead or cinnabar” (Duncan. p58). Clivia miniata are always found under tree cover, often growing on well –draining slopes of the forest floor rich with leaf mould. They can also be found on rocky ledges and between sandstone boulders on slopes. They are found in areas from the Eastern Cape Province to Swaziland and KwaZulu-Natal. These clivia grow from 500mm to 1 metre in height, and they sucker freely and will form large clumps. The leaves are usually about 50mm wide in the wild, but cultivated varieties can have leaves over 100mm wide. The leaves can be up to 1 metre in length. The flowers in the wild tend to be orange in colour, although there are very rare paler yellows, peaches, and pinks that have been found. The flower shapes in the wild can vary from small and open to large, trumpet shaped flowers. This is the most easily recognisable clivia, and is, in horticultural terms, the most important of the species. The name ‘mirabilis’ is in reference to the miracle of discovering this unusual species in a very inhospitable environment. Clivia mirabilis is a newly discovered species that was only confirmed in 2001. They are found in the Northern Cape, and are extremely rare in cultivation. There is no known population outside the Oorlogskloof Reserve. In the wild, they grow in the humus between cracks in sandstone rocks, in light woodland of evergreen forests. These clivia have very thick roots that will survive under rock slabs. Unlike the other five species of clivia, this clivia originates from a Mediterranean–type climate, and requires a relatively dry summer, when it is naturally dormant. These clivia grow from 600mm to 1200mm in height, and the leaves are distinguished by a pale white striation on the leaves, which gradually fades as the leaves age. The basal part of the leaves is also distinguished by a deep maroon tinge. Of all the clivias, this is the most difficult to grow in cultivation, as it is extremely sensitive to over-watering, and will rapidly rot if drainage is not sharp. This is the genus that was named in honour of the Duchess of Northumberland, who had the family name of Clive, and it is the first clivia that was discovered. This species is only found in the Eastern Cape, mainly in coastal areas. They are found in coastal dunes, and also under the dense canopy of evergreen forests, on rocky slopes, and also on river-banks. These clivia grow from 500mm to 1100mm in height, and the leaves are distinguished by leaf margins that have a distinct serration, with the apex having either a weak or strong notch. Seedlings of Clivia nobilis are very slow to develop compared to the other species. In cultivation, these plants make wonderful container plants, and are also very well-suited to the garden. They are very drought tolerant once established, and readily produce offsets. The leathery leaves make them less susceptible to fungal diseases then other clivia species. The name ‘robusta’ is in reference to the robust nature of this species, and it also resembles a robust form of the species Clivia gardenii. Clivia robusta is usually found in swampy terrain or near water, in deep shade in forested areas. They are found from the Eastern Cape to Oribi Gorge in the southern part of KwaZulu-Natal. These clivias grow between 1 and 2 metres in height, and may or may not produce buttress roots. The leaves are between 400mm to 1200mm long, and 35mm to 90mm wide. There may be a weak pale striation occasionally in younger leaves. This plant is ideally suited to cultivation, both as a potted plant and in the garden. 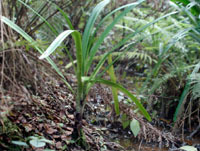 Forms that originate from the swampy habitat can be grown in poorly drained soil, but also thrive in normal growing conditions.